Suppose you work at your computer and suddenly big catastrophes happen. Unfortunately, your computer is gone, but luckily all your photos, music, and important documents are stored online in the cloud. If something is stored in the cloud, it means that it is stored on an internet server and not on your computer. It’s like an extra hard drive that you can access from anywhere, anytime when connected to the Internet. 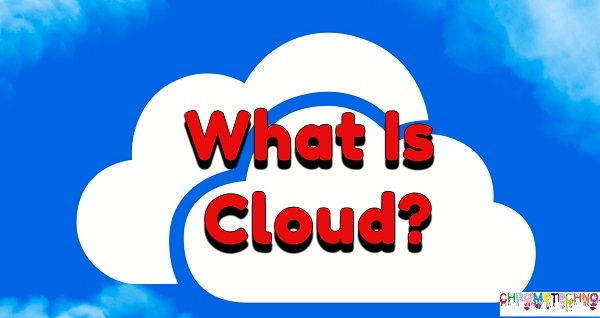 In a technical word, What Is Cloud: cloud means a dense cluster of computers working together to make it appear to a normal observer as a huge computing resource. You can even make a device on your PC, phone, or another computing device on a simple device, such as a Chromebook, but it actually runs on the Internet over a number of computers sharing resources. In the past, you only had one home computer and the software installed on it. Thanks to cloud-based applications, the web apps that run in your Internet browser, you can now take your files wherever you go. A web application that you may already use in Google Docs. It’s free, you do not have to install anything to use it, and you can create different types of projects, such as – Documents, Spreadsheets, and Presentations. You can access everything you create in Google Docs from any Internet-connected computer or device. Because you only need one connected device to access the cloud, you can always bring your music, photos, and videos with you. For example, if you’re taking a photo of your smartphone and uploading it to a cloud-based photo storage service, such as: For example, Picasa or Flickr, you can access this photo with any other device, mobile phone, computer or even this photo on your TV. You can share your holiday photo with your family and friends. While you are still on vacation. If your photos and other multimedia content are stored in the cloud, you do not have to worry about a computer malfunction getting lost. By saving files in the cloud, you can protect important files from accidents, viruses, and more. You can use cloud-based storage services, such as Carbonite or Mozy, to back up the contents of your computer. These services are run continuously and automatically backed up. So you always have the latest versions of your files stored on secure online servers. Suppose if your system is crashed, you can easily transfer your backup files from your cloud storage to another device. So, what are you waiting for? No matter how you use your computer, smartphone or tablet, the Cloud offers you something. Whether you’re checking your emails on the go, backing up your favorite photos and music, or using the web app to work in different locations, the cloud can make your life and technology manageable. Drop boxes cheapest paid account gets you 100 gigs of storage. You can’t actually but a 100 gig hard drive these days let alone a 2 gig one but that’s where the shared resources come in you are renting some of a hard drive some bandwidth cost for the data center and some of the power cost for the PC it’s sitting in and that’s how the cloud works.